Random Saturday cider tasting, awesome! 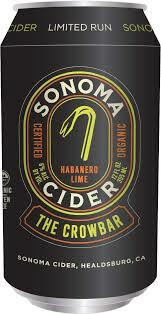 The Crowbar is a limited release Habanero-Lime cider from Sonoma Cider (available since May 2015). I’ve been wanting to try this variety but was unsure if it was something I’d immediately want to dump out, between the spice and the dryness, so I’ve held off. I was lucky enough to attend a tasting event of Sonoma Cider at Whole Foods in Lynnwood WA today (where I got to meet Sarah from Cider Log!). They were offering their Hatchet (apple), Pitchfork (pear), Anvil (bourbon), and Crowbar (habanero-lime) ciders. They also have The Washboard (another limited run cider, with sarsaparilla & vanilla), which I definitely wasn’t a fan of but my husband loved, which they weren’t tasting. Opinion: With a good sniff some spice is definitely perceived. Upon tasting, I pick up both habanero and lime. The lime is more present than for example Schilling’s Sriracha Lime, which helps calm down the heat. It also had less spice & bite to it than the two other spicy ciders I’ve tried (Schilling Sriracha Lime and Finnriver Habanero), but was definitely spicy. I was expecting it to be much more dry as it only has 2 grams of sugar in 12 oz (1.1 Brix), but I perceived it as semi-dry instead of bone dry for some reason. The sample (a few sips) was drinkable enough, but this isn’t something I’d want to buy even a can of. I just don’t think spicy ciders are for me. More of a novelty? Apparently some folks have got this to cook with. I think I’ll stick with their Anvil (bourbon flavored) cider, which I think is quite tasty. Opinion: Crisp/clean & smooth but overly appley apple flavor. Sweet but not very sweet. Tastes sugary and overly appley, and I guessed it was back sweetened with apple juice concentrate. I was right! Further, they actually add pure sugar after fermentation (listed on the ingredient list). I’m surprised the cost of this cider (~$9 for four 11oz bottles) is so much more than its competitors, Angry Orchard, Woodchuck, etc (same price for six 12oz bottles), and that they would actually import this stuff. I imagine real German cider is better (I have one in the cue). I’d put it as better than Angry Orchard & Strongbow but not as good as Woodchuck. ← Countdown to Cider Summit Seattle!